Where Should I Begin Searching for a House in Naples, Florida? Finding a home in an unfamiliar, new area can be a daunting task for anyone. Likewise, trying to describe all the different areas to live in Naples, Florida within one blog post, is an equally unnerving. Trepidation aside, here is a beginners guide to starting your home search in Naples. Caveat: These are broad strokes for getting a “lay of the land” and not meant to cover every community or lifestyle choice. Rely on a knowledgeable local Realtor to meet your specific needs and price range. In Naples, we have home buyers from the northern US states, Canada and abroad. Many have not even been to the area before they start to search the Internet for the perfect deal. Most people dive in to listings in their price range. They rely on photos and descriptions on the listings and perhaps an attached map. What’s my lifestyle? Golf, beach, tennis, biking, shopping and dining, social gatherings, etc. Do I prefer gated or non-gated (usually fewer rules) communities? Do I want to be as close to the beach and Gulf of Mexico as possible or is a 15 minute drive to the beach acceptable? While this is by no means a comprehensive list of questions, the answers will help narrow down the broader areas in Naples where you should focus your property search efforts. Of course price range (which I will not get into detail on here), will dictate and rule out many areas. The areas detailed below provide a wide range of properties available to meet almost every lifestyle need and desire. Let’s start with the main draw for most who come to Southwest Florida: the beach and Gulf of Mexico. For the most part, Naples communities West of US-41, along the beach are non-gated. The exception being ares in Pelican Bay like Bay Colony. Use the map above and draw an imaginary line parallel to the Gulf of Mexico along US 41 (also seen on the map as Tamiami Trail N and 9th St. N). If you start as far South (bottom of the map) in Naples as possible, the luxury community of Port Royal is first up (just north of Keewydin Island), then Aqualane Shores, Old Naples, Coquina Sands, Moorings, Park Shore, Pelican Bay and Naples Park and Vanderbilt Beach (in order heading North). Luxury homes in Port Royal sell for $3 million to over $20 million for newer homes on the beach. In Old Naples beach front single-family homes can go as high as $19 million, but older homes can be purchased in Old Naples for around $700,000 and condos for even less. In the Moorings and Park Shore there are no single-family homes along the beach, only condos. Single-family homes in this area are situated on waterways leading to the Gulf and on quaint tree-lined streets. Further north in Pelican Bay, high-rise condos are set-back behind miles of natural mangroves and estuaries. Pelican Bay is a large community made up of many smaller subdivisions of condos and single-family homes. Pelican Bay is really the start of what the locals refer to as “North Naples.” North Naples is a very loosely defined area and can include areas East of I-75. To glimpse of the Gulf of Mexico from most Pelican Bay condos, you have to be on at least the fifth floor or higher. On lower floors you will only see trees and tree tops. The only homes you will see on the beach in Pelican Bay may look like small condos to some, but are actually single-family residential homes located in an exclusive enclave called the Strand at Bay Colony. Royal Harbor is also worth mentioning here even though it is not “technically” West of 41. Royal Harbor is just over the Gordon River Bridge. Naples Bay separates it from Old Naples and Aqualane Shores. Royal Harbor has many waterfront homes with direct access to the Gulf of Mexico. For those that like to search by zip code, West of US-41 includes parts of the zip codes 34102, 34103 and 34018 in Naples. Keep in mind there are homes in these zip codes that are not West of US-41, but the majority are. An even better reference for searching homes West of US-41 is the “NA” (Naples Area) codes used by local Realtors to designate areas of Naples real estate is for sale (White Sands Realty can provide a map of Naples with the NA codes on it for you convenience, just ask). NA codes West of Us-41 include NA07 (Port Royal & Aqualane Shores), NA08 (Royal Harbor), NA06 (Old Naples), NA05 (Moorings, Park Shore, Coquina Sands & Seagate), NA04 (Pelican Bay, Bay Colony & Strand at Bay Colony), NA02 (Vanderbilt Beach), NA03 (Naples Park) and NA01 (Barefoot Beach). You can search by all of these and more using the “Area” section in our Property Search. 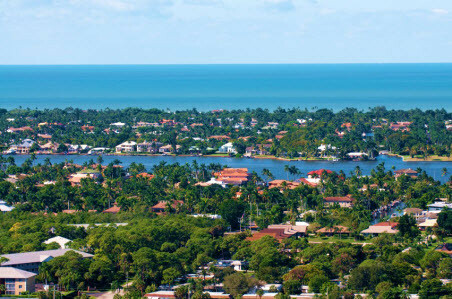 While this area is broader and less defined than the beachfront communities described above, it comprises the majority of mid-price range real estate many Naples home buyers are looking for. In this vast corridor, there are too many communities to list them all here, so I’ll only cover some of the major movers and shakers in the region. For golfers or those that wish to enjoy the breathtaking views Florida golf courses can offer, there are several notable golfing communities in the lands West of I-75. 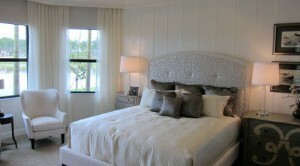 Both luxury and proximity to downtown can all be had at Grey Oaks and the Estuary at Grey Oaks. Other notable golf communities, West of I-75, include Tiburon, Pelican Marsh and Colliers Reserve. Outside of golf there are many communities that may peek your interest. For newer homes try Marbella Lakes or Aviano. If you’re looking for more land you may want to search in Pine Ridge, Livingston Woods or Quail Woods Estates. Zip codes in these areas, West of I-75-East of US-41, include parts of 34102, 34103, 34105, 34109 and 34110 in Naples. NA codes include NA11, NA12, NA13, NA14, NA15 and NA16. Communities East of I-75 are priced lower due to the simple fact of location. These homes can equal or rival the quality of homes closer to the beach, but because land costs less further from the Gulf, the homes in this local are priced accordingly. In this area, you are about 15 to 30 minutes (sometimes longer) from the beach. If you can live with that, then there are some great values here that you don’t want to pass up. Some of the hottest communities East of I-75 include, but are not limited to, Riverstone at Naples (new homes from the $300’s to $600’s), Olde Cypress (golf course community), The Quarry (golf and new homes and condos), Twin Eagles (golf, homes and condos), Saturnia Lakes (resales of single-family homes) and Longshore Lake (tennis, dining and single-family homes). Another area you may come across often in this area of Naples is Golden Gate. Golden Gate, including Golden Gate City and Golden Gate Estates, encompasses the majority of Collier County East of I-75. Golden Gate is a low-density, non-gated community that stretches all the way to the Everglades. Much of it is still very rural with dirt roads and homes on 2 to 5 acre (and larger) parcels. The vast majority of Golden Gate is on well water and septic systems. Zip codes East of I-75 include parts of 34116, 3419 and 34120 in Naples. NA codes include NA21, NA22, NA23, NA24 (Golden Gate City), NA31, NA32, NA33, NA34, NA35, NA36 (Ave Maria), NA41, NA42, NA43, NA44, NA45, NA46, NA47 and NA48. Following the guidelines above should help narrow down your search area to a more manageable realm. Still, nothing can beat the knowledge and experience a local Naples Realtor can provide. Don’t hesitate to call or email us with questions about the areas and communities described above or others you come across in your Naples property search. My Naples Real Estate Team and I have over 50 years of residency here. Naples is our home town. What is your thoughts on Lely?